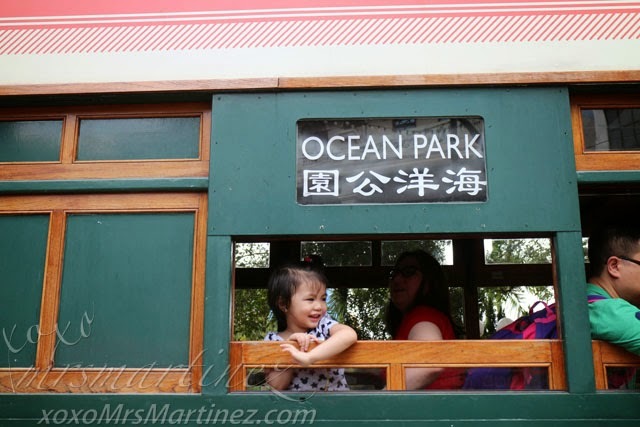 I went to Ocean Park Hong Kong several times as a child. I remember when I was about the age of 10 or 11, my mom took me to Water World inside the park. It was a huge swim and play facility. It was open only during summer months. We spent the whole day frolicking under the sun. I wanted my little girl to experience the same thing but to my dismay, I learned that the old Water Park is now gone. It was closed down in 1999. But the good news is that Ocean Park Hong Kong will build a new all-weather attraction, Water World, at Tai Shue Wan. There are about 30 attractions planned including a pool with natural beach. It will be open all year round when it will be completed in 2017. 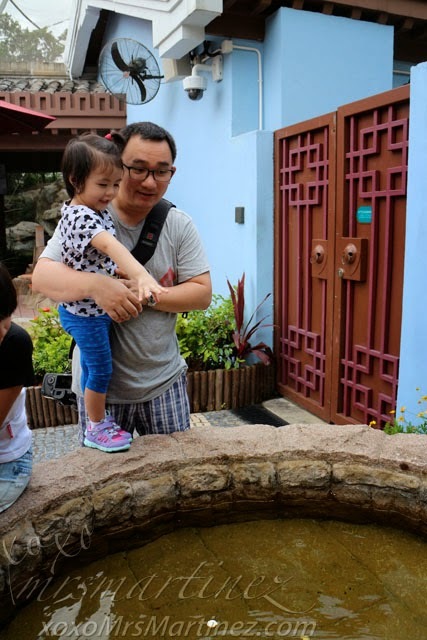 Even though we visited Hong Kong Disneyland the day before and was already tired from a whole day of walking, we felt that it would be better to visit Ocean Park Hong Kong on a weekday (Friday) than weekend. At least then, it won't be too crowded. It was a decision we did not regret. We purchased our tickets at MTR Admiralty Station. 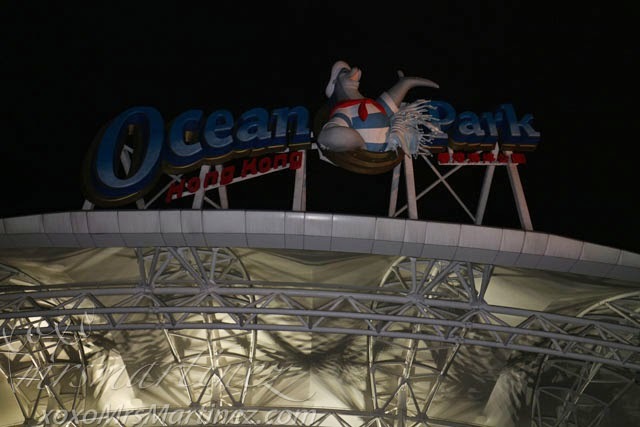 The Ocean Park Hong Kong tickets were sold at 10% off. 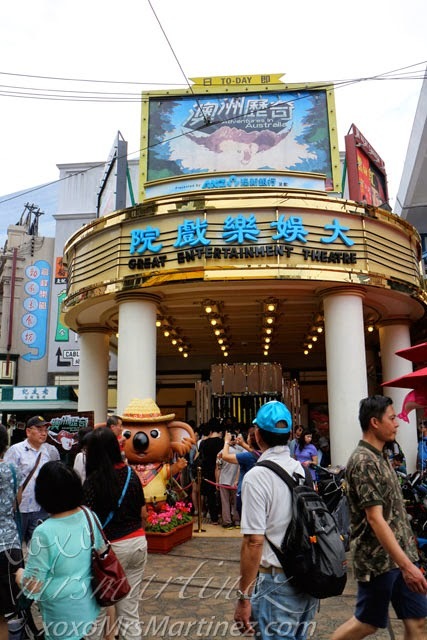 Upon arriving, we initially wanted to eat lunch but later on decided to enter the Great Entertainment Theater where it featured the Adventures in Australia. The line was fast-moving, we were in and out in about 30 minutes. The Great Entertainment Theater is a vintage theater showcasing South Australian Wildlife at its best. 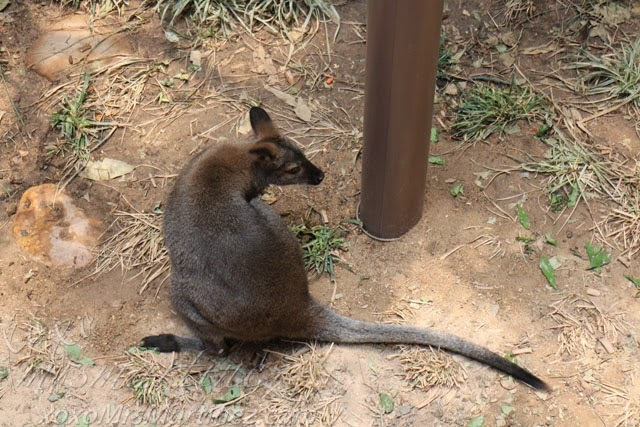 You can see koalas, red-necked wallabies and laughing kookaburras. Ying Ying or Le Le? 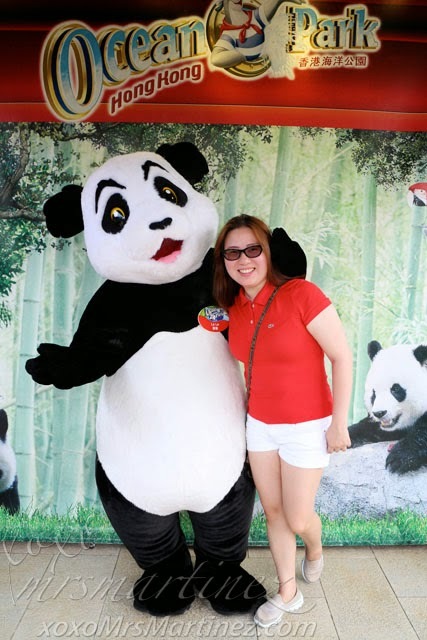 I don't know which of the two giant Pandas is the one in the photo above but it seemed unmindful of the people oohing and aahing outside of its cage. Ocean Park Hong Kong looks and feels outdated, it needs a facelift. Almost all of the souvenir shops are not stroller-friendly. My daughter was so scared to have a photo with the mascots because she was not familiar with them. 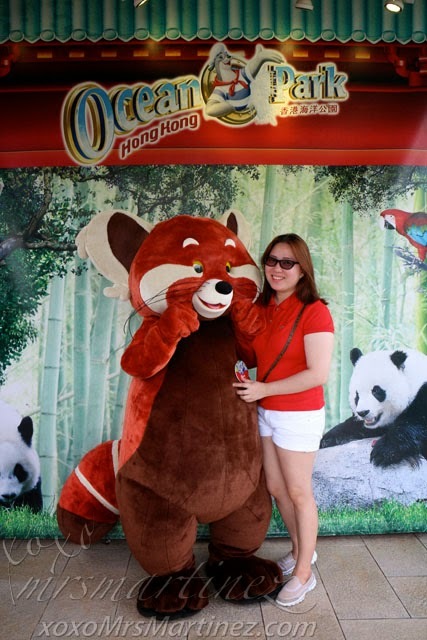 I, on the other hand, had to have a photo taken with these cute and adorable Ocean Park's mascots. 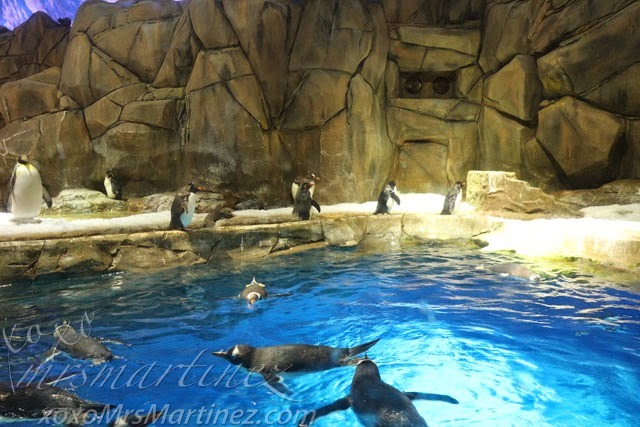 There are over 70 penguins from three different species- King Penguins, Southern Rockhopper Penguins and Gentoo Penguins. The temperature inside the Polar Adventure is kept at relatively low temperatures throughout the year. South Pole Spectacular at 8-10°C while in North Pole Encounter at 15-17°C. 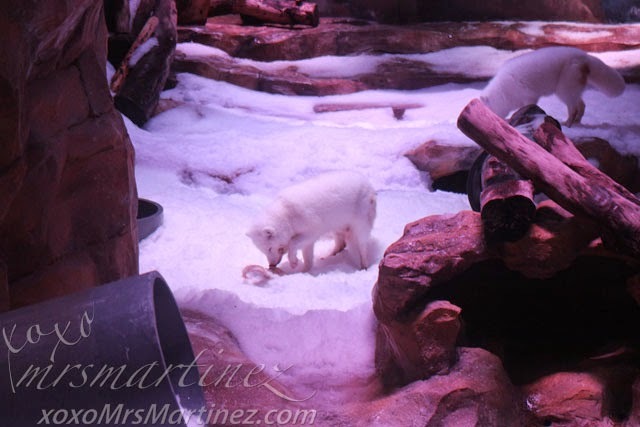 Adjacent to the South Polar Adventure is Artic Fox Den. These Artic foxes have short ears and legs to help prevent heat loss. 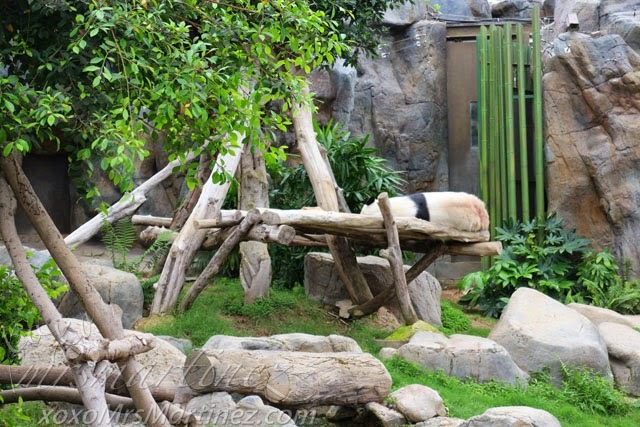 They also have bushy tails to wrap around their bodies for warmth. Their furs change colour from dark brown in summer to snowy white in winter. 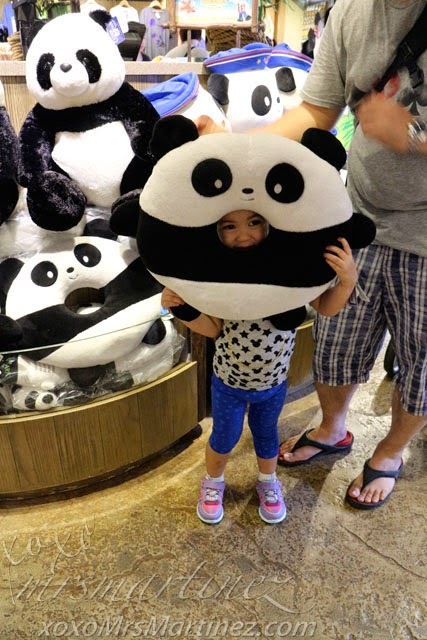 My daughter loves to pose for a souvenir shot together with stuffed toys displayed on the shelves. I am glad that she does not whine whenever I put everything back on the shelves. No, DH did not experience any of the thrill rides at The Summit. The two of them can ride all they want when my daughter is old enough, I will be taking their photos that's for sure. My little girl loves to throw coins and make a wish! Symbio is the world's first 360° water screen show in which two 9m-tall fiery dragons clash on screen! On a side note, Ocean Park Hong Kong attractions are located on two different sides of the mountain- the Waterfront and Summit. You can either choose to ride a Waterfront Cable Car for unprecedented views of the surrounding area, the sea and the entire park or ride the Ocean Express for a quick (4 minutes! ), smooth, thrilling and fun way to travel from Ocean Park's Waterfront to the extreme rides at the Summit. It will take about 70 minutes in line before you can ride the cable car. We took the Ocean Express on both ways instead. There is a special lane for those who have disabilities and babies on stroller. 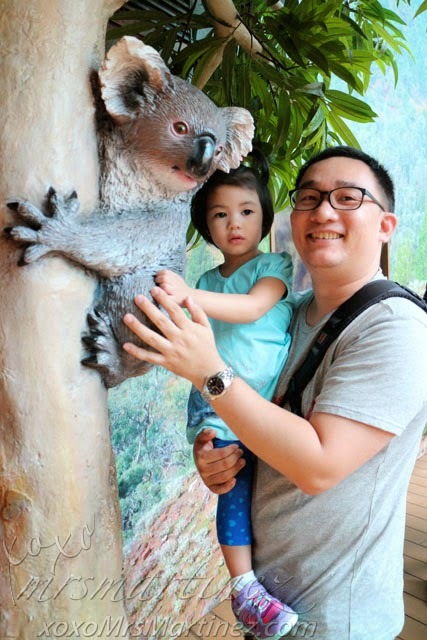 It saves us time a lot of time and we were able to enjoy a lot of the attractions on both locations. 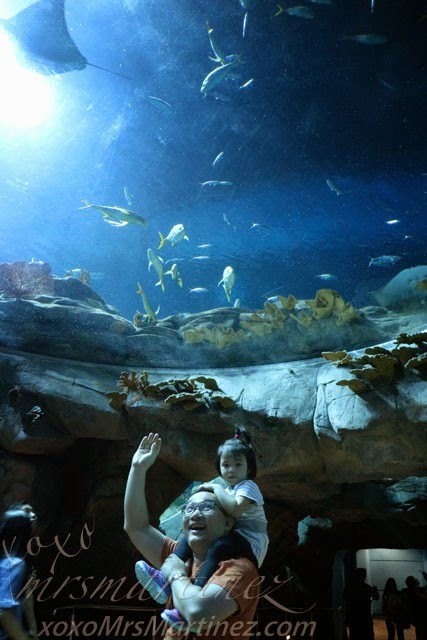 After watching Symbio at The Lagoon, we still have enough time to enter the Grand Aquarium. It was filled with 5,000 fish from over 400 species behind a 13m wide acrylic viewing panel. Before I forget, we were also able to watch the spectacular new show called "Ocean Wonders". The show really impressed my two year old. She even said that the dolphins and sea lions did a good job and gave her thumbs up sign. We will definitely be back when the park opens its new attraction, Water World, in 2017. 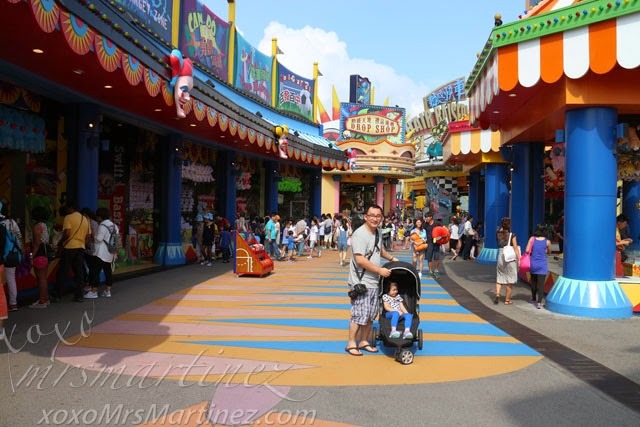 Read about our Hong Kong Disneyland Adventure here. 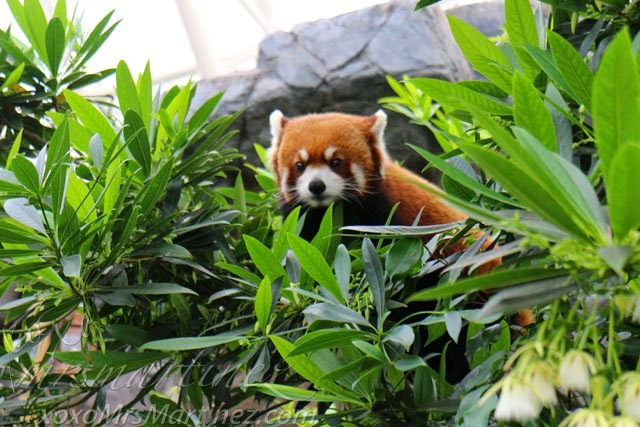 Ocean Park Hong Kong is located at Wong Chuk Hang and Nam Long Shan in the Southern District of Hong Kong. 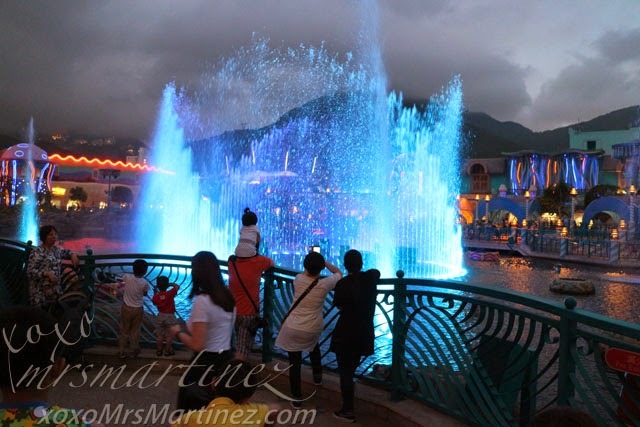 You can read about more about our Hong Kong Disneyland Adventure Day 1 here and Day 2 here. My new baby, Bottega Veneta Brunito Intrecciato Gros Grain Messenger Bag. Check out Ovolo West Kowloon Hotel.